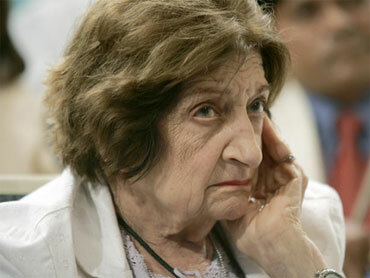 Helen Thomas: "I Want Your Conscience to Bother You"
Syndicated columnist Helen Thomas today told White House press secretary Robert Gibbs at his daily press briefing that she keeps asking about the public health care option because she wants his "conscience to bother" him. Thomas pressed Gibbs on whether the White House was actively supporting the creation of a public, or government-run, plan in negotiations over health care legislation. The public option is supported by liberal Democrats in Congress but opposed by Republicans and some moderate Democrats. President Obama has said he supports the public option but signaled that he would sign a bill that does not include it. "Has the president given up on the public option?" Thomas asked, prompting Gibbs to suggest she asks the question every day. "I ask it day after day because it has great meaning in this country, and you never answer it," Thomas said. "I apparently don't answer it to your satisfaction," Gibbs said with a smile, prompting Thomas to say, "that's right." When Gibbs began saying, "I'll give you the same answer that I gave you unsatisfactorily for many of those other days," Thomas interrupted, asking, "Well, is he going to fight for it or not?" "We're going to work to get choice and competition into health care reform," Gibbs said. Replied Thomas: "You're not going to get it." "Well, then why do you keep asking me?" asked Gibbs, to laugher from the press corps. Said Thomas: "Because I want your conscience to bother you." A visibly flustered Gibbs then said, "I -- well! Should we sit down and I confess a little bit to you and -- no -- I'm -- go ahead -- I'm..."
When the next questioner began, Gibbs said, "Are you going to make me feel bad too?"